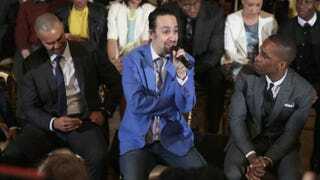 Members of the Broadway cast of Hamilton, including (from left) Christopher Jackson, creator and star Lin-Manuel Miranda, and Leslie Odom Jr., conduct a Q&A session with students in the East Room of the White House in Washington, D.C., on March 14, 2016. The 2016 Tony Award nominations were announced Tuesday morning, and Hamilton made history with 16 nominations. Lin-Manuel Miranda, the creator of the musical, received three individual nominations, for best book, best original score and best lead actor. Not to be overlooked are other nominees, including Shuffle Along, with 10 nominations, one of them best musical; and Danai Gurira’s Eclipsed, about women in war-torn Liberia, which was nominated for best play and received several acting nominations, including Lupita Nyong’o for best lead actress, in addition to other nominations. Leslie Odom Jr. received a best actor nomination for Hamilton; The Color Purple received a nomination for best musical revival; Cynthia Erivo received a nomination for best lead actress for The Color Purple; and Danielle Brooks was nominated for best featured actress for The Color Purple.